The ‘Nash Route’, which runs for two miles northwards from The Mall to Regent’s Park, is probably the grandest scheme of urban planning in London. Chris Rogers’ fascinating walk showed how John Nash’s vision set an urbane standard which has influenced development right up to today. Combining Royal patronage with commercial opportunity on land owned by the Crown Estate, the route has kept its coherence through 200 years of change. George, Prince of Wales, built Carlton House, and commissioned this processional route from Nash in 1810. His palace was replaced by Carlton House Terrace after 1825, and we mounted the Duke of York’s steps and walked the rising slope to Lower Regent Street (now re-named by the Crown Estate). Two modern buildings respond to the formality of Waterloo Gardens: the large modernist British Council complex (Howard Lobb with Sir Frederick Gibberd, 1970-75) in Portland stone fits in and has weathered well. 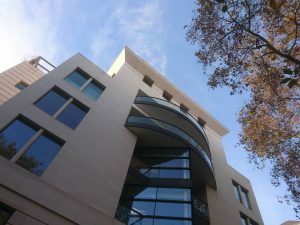 The elegant Stirling Square by Stirling and Wilford, clad in French limestone, is much quieter than their No 1 Poultry. Further up Regent Street, we saw where the Crown Estate has cleverly inserted a new pedestrian plaza for St James’s Market, with a suave new building by MAKE architects and a gallery for art exhibitions. Piccadilly Circus was a true circus until Shaftesbury Avenue was punched through in 1886. The County Fire Office – rebuilt with a nice dome in 1924-27 – is an eye-catcher; the westward sweep of The Quadrant then introduces Regent Street, which cunningly overlaid the pre-existing Swallow Street. The unity of Nash’s Quadrant was first disrupted by Richard Norman Shaw’s vast Baroque Piccadilly Hotel, then the rest was replaced by Reginald Blomfield’s plainer version in 1923-28. Just behind is the former Regent Palace Hotel, where Dixon Jones has carefully conserved Oliver Bernard’s wonderful Jazz Modern restaurant and bar. Regent Street boasts some of the best shopping in London, behind well-mannered Portland stone facades. Liberty’s faces the street with Baroque and a huge symbolic frieze, but behind is pure Tudor of 1922-24, built from authentic ships’ timbers. Oxford Circus (originally Regent Circus North) has kept its proper form, and leads to Nash’s next eye-catcher, the rotunda and spire of All Souls Langham Place. G Val Myer’s suave Portland stone Broadcasting House of 1930-32 disguises another shift of the street line to the west, to meet the Adam brothers’ pre-existing Portland Place. The new BBC headquarters behind (begun by McCormac Jamieson Pritchard in 2000) creates a fine new plaza, but sadly the building is less publicly accessible than intended. Portland Place entices you northwards with distant views of the arcadia of Regent’s Park. Nash’s Park Crescent terraces were bombed in WWII, and the West Crescent is being re-built again in authentic replica. We saw two superb interiors with dramatic vertical circulation. G Grey Wornum’s elegant Swedish-inspired RIBA headquarters (1932-34) features a triple-height staircase with huge fluted columns, while Lasdun’s wonderful Royal College of Physicians (1959-64) is designed around an expanding spiral formal staircase. Outside, its elegant mosaic cladding is a final tribute to Nash’s urban vision.